This summer is becoming the season of salads, and this one comes from April’s Food and Wine. It’s from Jeremy Fox of Ubuntu which is a restaurant and yoga studio in Napa. The restaurant’s menu focuses on vegetable-inspired meals with daily-harvested and farm-fresh produce. I hope to visit it one of these days, but until then, I have the recipes from the magazine. For this salad, I feared the ingredients might require an extended search mission, and I was ready to make substitutions as needed. Just when I was willing to relent, I easily found both red quinoa and black radishes. Little shopping successes like that give me hope for future ingredient hunts. Once all the items had been gathered, the salad was very simple to assemble. First, red radishes, black radishes, carrots, and fennel were thinly sliced on a Benriner. Then, the slices were transferred to a bowl of ice water which was refrigerated for an hour. That is what made this salad what it was. The vegetables became incredibly crisp with a lasting, transformed texture. The red quinoa was cooked in water, allowed to cool, and then combined with a simple vinaigrette of lemon juice, lemon zest, olive oil, salt, and pepper. The shaved vegetables topped the quinoa to finish the salad. It’s so simple, it might even sound boring, but it was light, crunchy, and lemony. The vinaigrette mixed into the quinoa brought plenty of acidity and seasoning for the entire plate. The flavor of the fennel mingled its way among the other vegetables in a nice way, and the cold crispness of the slices were the textural opposite of the cooked quinoa. I hadn’t eaten black radishes before, but the flavor was very mild. The skin was thicker than that of the red radishes, and they seemed a little firmer when being cut. The visual appeal of the contrasting colors and shapes matched the experience of eating the different textures in the salad. Simply put, this was fun to eat, and chilling shaved vegetables is a technique I’ll definitely use again. This looks great! And thanks for the tip on the veggie chill. How is the red quinoa vs. reg.? I'm not sure if the lemony vinaigrette masked any difference in taste of the red quinoa, but I thought it seemed the same as white. i love lemons! looks very refreshing and perfect for this weather. we are definitely in the salad days of summer...! this looks great. I have never seen black radishes before, they look cool. I have also never had quinoa before. I will look for some to try this salad out. I am currently collecting fresh healthy recipes like this to make for work lunches. I LOVE quinoa! This looks fantastic and healthy. Full of protein! 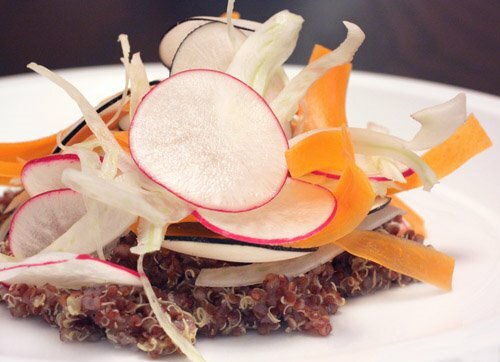 Must look around for the red quinoa and those BLACK radishes-where did you get them? This is an ART! the magic of simplicity. Beautiful looking salad. I haven't had quinoa yet, but I really want to. Looks delicisou. Oh my the salad looks so exotic! Never tried black radishes, need to hunt them! 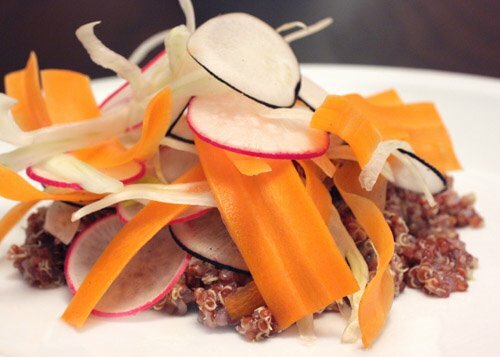 Have never tried the red quinoa before nor the black radishes but the salad sounds amazing, not to mention so healthy. Lovely and delicious looking salad! The veggies are so pretty! The salad looks fab! The food presentation is simply awesome! Sweta: I found the black radishes and red quinoa at Central Market. what a great use of summer ingredients. Love the combi and the nice colours. how delightfully summery and festive! confession: i didn't know black radishes even existed. they have now been added to the rapidly growing list of things to try. This is so refreshing and light to eat in the heat! I've never even heard of a black radish before! This is such a gorgeous dish! I don't know how often I've said that quinoa is my next to-make ingredient - thanks for a delicious reminder. As for black radishes, I will keep my eyes open but doubt I'll be as fortunate as you - still, it's worth looking! Ack! I'm falling behind again - get ready for a flurry of comments throughout the day! I've never even heard of black radishes before! Maybe I just haven't looked that hard?? That salad is so pretty, colorful and looks really good! a great idea! So pretty! Black radishes, how intriguing! Pretty salad! Quinoa is my new favorite thing! Never tried the red though. . . So gorgeous and healthy-looking. I will have to try the black radish. some of the shaved veggies almost look like snack chips! This looks very elegant and pretty!! Yay, another gorgeous salad! It really looks like it should be served at a fancy restaurant! I remember seeing that recipe in the magazine. Your rendition turned out magnificent. Kudos to you! Heven't seen red quinoa..very interesting...do they taste different? Anyway, this salad looks terrific and healthy. Love the colors in it. Yummie! this looks so great! I love when the veggies are thin and crisp. great site! i have never ever even heard of black radishes!would work really well during halloween:-) those look unreal. still need to try quinoa.. love the salad.